NYSE Liffe is the global derivatives business of the former NYSE Euronext, and is now part of the Intercontinental Exchange Group (ICE). NYSE Liffe was the name given to the exchange previously known as the London International Financial Futures Exchange (LIFFE) when it was acquired by NYSE Euronext. LIFFE was founded in September 1982, offering futures contracts and options linked to short term interest rates. In 1993 and 1996, LIFFE merged with the London Traded Options Market (LTOM) and London Commodity Exchange (LCE), respectively. With these mergers, LIFFE added both equity options and a range of commodity contracts. In 2002, LIFFE was acquired by Euronext to become Euronext.liffe, which was eventually rebranded as NYSE Euronext and includes several markets: the US derivatives market (NYSE Liffe US), the global derivatives market (NYSE Liffe), and the global equities market (Euronext). ICE purchased NYSE Euronext, which was the parent company of NYSE Liffe, in November 2013. In 2014, Euronext completed an initial public offering making it once again a standalone company. You can find the preceding information on the Liffe http://www.euronext.com/landing/liffeLanding-12601-EN.htmlwebsite. Set the machine that hosts the TT Gateway to run in (GMT) Greenwich Mean Time zone and time (London time) with Daylight Savings enabled. Individual Trader Mnemonics (ITMs): used to identify Order Sessions. LIFFE Connect customers that migrate to the UTP protocol may request that the exchange permission existing ITMs for UTP. However, you cannot use the same ITM to connect to both platforms at the same time. The exchange pairs an ITM to the firm’s “Responsible Person” as defined by the exchange. TT Gateways forward the ITM value to the exchange as the SenderCompID field in the Common Customer Gateway's (CCG) binary protocol. Member mnemonic ID: used to identify the trading firm or trading group in login messages to the CCG. TT Gateways forward the member mnemonic ID to the exchange as the SenderSubID field in the Common Customer Gateway's (CCG) binary protocol. Unique Source IDs: used to subscribe to the exchange XDP Retransmission Server. You must use at least one Source ID per TT Gateway. You may utilize additional Source IDs to improve gateway performance during recovery. TT Gateways forward the value of the ReplayID1 parameter in the hostinfo.cfg file to connect to the Retransmission Server. Standing Data FTP Server IDs: used to access the exchange FTP server in order to download initial instrument definitions. TT Gateways forward the StandingDataServer, StandingDataUser, and StandingDataPass parameters in the hostinfo.cfg file in order to access the Standing Data FTP Server. TT Gateways 7.16 and higher contain an enhancement to support the UTP Low Bandwidth Services out of the Liffe Singapore Hub. The Low Bandwidth Servers broadcast is not supported in older versions of the TT Gateway. In addition, you must order the correct multicast channels from the exchange.The exchange offers both Single Stream and Grouped Channels. TT does not support any of the Single Stream Channels. You may, however, order either all or just a subset of the Grouped Channels listed below. Users may request a subset of the grouped channels. For example, some users may request the entire Equity and Index Derivatives channel. However, if you do not trade Amsterdam, London, Paris and Brussels, you may request access to the Lisbon Equity and Index Derivatives Grouped channel directly. TT Gateways connect to the exchange via the Universal Trading Platform (UTP). Exchange Data Publisher (XDP): provides market data for the markets available on the UTP. The TT Gateway listens to the XDP multicast to provide market data for all products. Common Customer Gateway (CCG): manages all order and fill related messages. The CCG establishes point to point communications using TCP/IP connections. FTP Standing Data Server: The exchange provides initial product security definitions as Standing Data .xml files which the gateway downloads via the exchange’s FTP site. Retransmission Server: Used to request missing market data packets via a direct TCP/IP connection. Refresh Server: Supplies a snapshot of current market data. This occurs following an intra-day restart or when the Retransmission Server cannot provide the missing data. For a complete description of market data delivery using XDP, refer to Understanding the Price Feed. For a complete description of order management, refer to Understanding Order Management. For access to the UTP, clients must obtain a connection to the Secure Financial Transaction Infrastructure (SFTI) network by entering into a Connectivity Agreement for SFTI Services or establish a connection through TTNET. 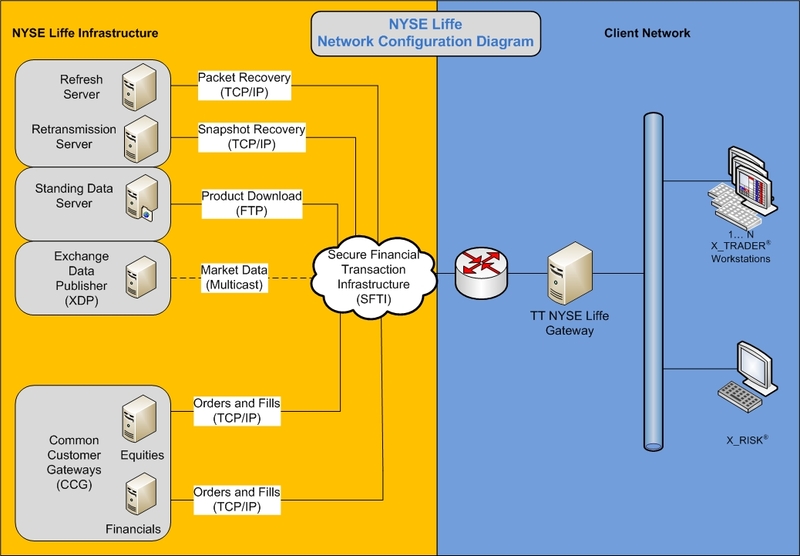 Liffe Technologies offers the Secure Financial Transaction Infrastructure (SFTI®). SFTI (pronounced ‘safety’) is a high-speed/low-latency network that provides access to Euronext’s Global trading engines. TTNET, TT’s fully managed hosting solution, provides SFTI connectivity to its customers. Non-TTNET customers must arrange for their own SFTI connectivity. Customers should contact their Liffe Account Manager to discuss options for SFTI connectivity and pricing. Liffe’s new data center in Basildon (near London) will house the primary matching engines for all European Liffe and Euronext exchanges. The exchange uses its own clearing, in conjunction with LCH.Clearnet Ltd., to serve as the central counterparty for its trades. Liffe Clearing has its own clearing members, who must also be members of LCH.Clearnet Ltd. via Tri-partite agreements. Commodities contracts are available as both Futures and Options. The exchange may change its listed products at any time. For currently listed products, contact Liffe or visit their http://www.euronext.com/landing/indexMarket-18812-EN.htmlwebsite. Liffe offers seven trading phases: Session Start, Pre-Open, Open, Pre-Close, Settlement, Close, Session Close. The follow table shows the general trading periods available from Liffe and Euronext. All hours are listed in Greenwich Mean Time (GMT). Trading hours vary by product. The ranges above represent the trading hours for most products. Some product trade outside of the given ranges. For complete trading hour information, refer to the exchange website. After the market open, Market On Open (MOO) orders behave like Good Till Day (GTD) orders and will only remain working in the market until the end of the trading day.